So I know that I said that I have no idea how my Etsy will work when I have kids of my own but that’s not really true. I actually have a pretty good idea how I’ll do it. While I don’t know how every minute of my days will be chopped up since I haven’t had kids full time, I do know a few things about how to get things done with kids around. There were a few months that I took care of my baby niece while my sister worked. Now my nieces also come over all the time and hang out while I’m working (often while Mom or Grandma are running errands). I’ve also had a number of friends and helpers who have kids around while we work. All that is to say that I’ve learned some things about managing kids while getting my work done. Let me first say, I am exceptionally good at multitasking. I know that’s not the case for everyone. If you are someone that really needs to focus on one thing at a time you might do better with working while the kids sleep or look into having someone come to the house to watch the kids for a couple hours a week. I know many fellow shop owners who swear by this approach. 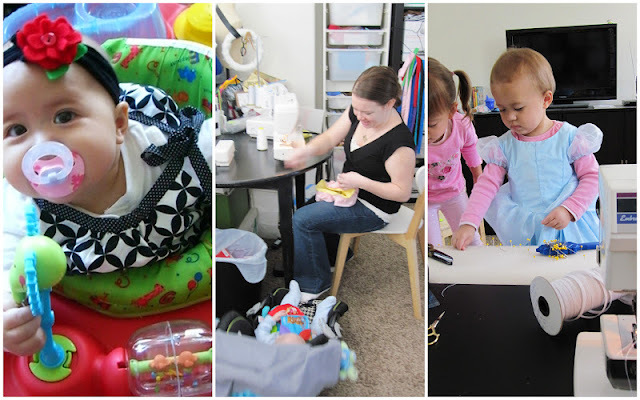 But if you want to try to juggle here’s a few tips from me and some of my fellow EtsyKids team members. The set up that works for me has me behind an open area where the kids can play. This way I can work while seeing everything that they are doing. I have the stuff they can’t get into out of reach or closed up in boxes and the stuff they can play with easy for them to access. I’ve got tubs of toys in my work room, an exersaucer and many kid movies. Little babies do great in car seats close, new crawlers get a barricade around an approved space (with tubs, boxes, etc.) and older kids have a variety of toys, craft stuff, etc to freely use. And of course there’s TV and movies. The Wiggles and Princess and the Frog are favorites here. 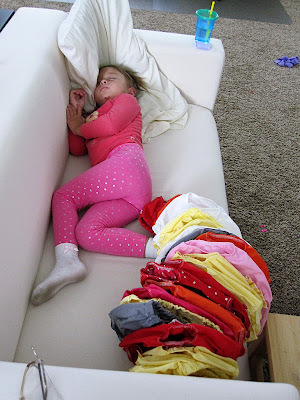 Do your planning and prep stuff while they are asleep. Even though I’m really good at multitasking its hard to think and juggle. Do you’re thinking when it’s quite that way you’ll have your list to consult when there are many competing voices. Bethany of Bethany’s 5, mom of 5 (ages 5 to 12) says her schedule is very important. She works weekdays from 7am to 2pm. Starting her day with emails for her and cartoons for the littles. She makes herself a to do list with timeframes of when to complete things (I do this too). She leaves a lot of wiggle room to take care of the kids needs while working and if she doesn’t meet a goal for the day she understands that the work will still be there for her tomorrow or after the kids are in bed for the night. You’ll probably be trapped inside a lot but if you do something portable take advantage. After a morning of cartoons and computer work, Bethany takes to the porch with her little ones where they can play and she can crochet. I’ve done pinning and hand sewing while the girls played in the yard. Make sure the stuff they can and cannot play with is clear and in place. It takes too much energy keeping them out of your good stuff and constantly taking things away. If there’s stuff that you use that it’s okay for them to play with let them. They will love it (and that’s less junk to clean up since it’s already out). The nieces particularly like fabric scraps, that cardboard that bolts of fabric are wrapped on, and my ruffles. When they get older give them little jobs to help (my nieces are just barely able to help sort and cut ruffles and they love it – you know for about 5 minutes). Tiffany of Cupcake Dream gets her little one involved whenever she can. She even lets her hold glue, pull out shapes and draw next to her. While some kids (if you’re lucky) might entertain themselves, my nieces rarely do that. And while they are getting better at that the older they get, if they are around I’m probably interacting with them. 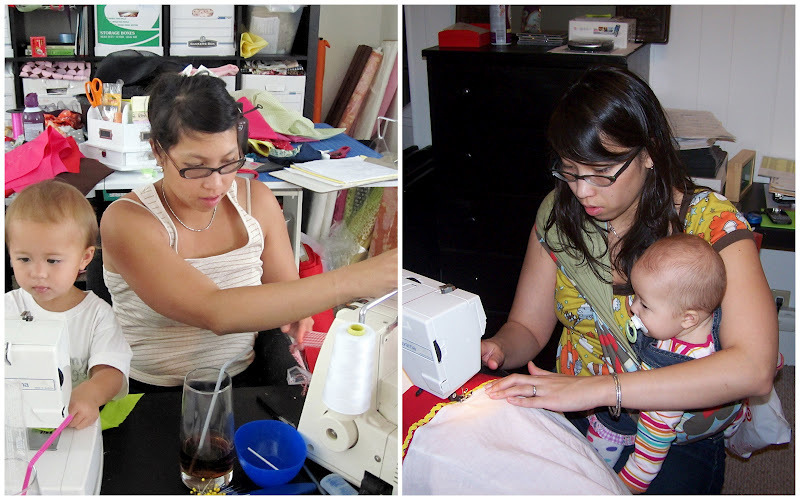 While I’m sewing I am always talking to them, telling them their drawings are pretty, giving them suggestions of fun things to do, getting kisses, giving kisses etc. Making faces at a cranky kids, singing silly songs, and talking to little ones while you’re doing other things with your hands really goes a long way. I’m working but I’m also there for them. Christine of Belly Bear Baby Gear often uses her kids as models. This lets her spend time with them while getting great pictures that do double duty: personal photo albums and etsy shop pics. When the girls were little I made many things for them that ended up in the shop. Now many of my creations, parties, etc. for them double as blog posts. Sometimes kids are just needy. If they need to be held a lot (or most waking hours like my niece did) slings come in mighty handy. Other times you might have to revert to just working with them on your lap. Yes this will probably slow things down but that’s just life and most kiddos probably won’t be this needy all the time. I have worked for many many hours with my niece in a sling or sitting on my lap. Other times you might just need to take a work break to be mommy (or aunty or grandma or whatever) but you are your own boss and you work from home so you can. This is where giving yourself generous turnaround times comes in really handy, a sentiment that Erin of Sweet Child of Mine Kids echos. I hope this has been helpful I would love you to share your own tips with each other so please by all means comment with tips that you have found helpful. Different things work for different families so it’s all about seeing what works for you. For more of these etsy related posts see my “etsy life” category. And I’d love to hear if you guys have any questions or topics you’d like me to hit on. Great tips – you are going to be one awesome (and successful!) mama one day! I have my work space right next to the kids playroom, and anytime I’m doing something they can “help” with (painting, cutting with scissors, etc) I give them their own supplies to do the same! And I save the really hard questions/design problems for nap time or bedtime! Love these tips ~ I’ve just set up a reading nook for the kiddos in my office which they seem to love so far!! Hey what’s up with Google Connect? I’ve seen a few linky follow gadgets but haven’t heard what really going on… insight? thanks cameron I hope you’re right! Heather, a reading nook is a great idea! So google is getting rid of Google friends connect on all non-blogger blogs on March 1st and there are rumors that they will be getting rid of the program all together so everyone’s just trying to get people to follow them in a way that won’t disappear (also I’m doing the linky followers since I’m nervouce that all the non-blogger blogs I love and follow will disappear from my reader, I have no idea if that’s what will happen when GFC stops on the non-blogger blogs but I’m doing it just in case). Great tips. 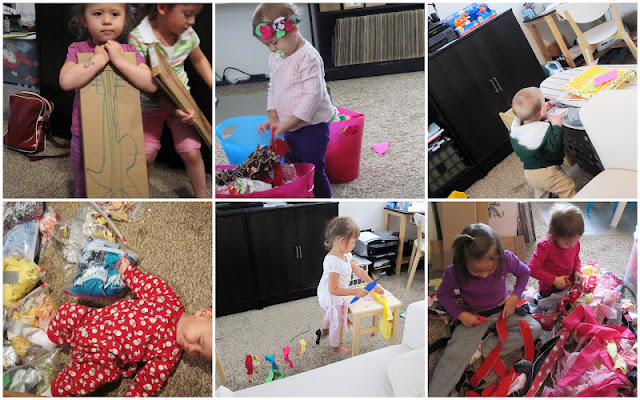 My kids are all grown but I’m going to share these ideas with my friends with younger kids! I’m loving the Etsy Life series! Thanks for sharing this! Hi – I’m new to your blog and a new follower. I’m a mom of 2 young boys and maybe more on the way ;). I love this series and could totally relate since I am an Etsy seller too. I’m planning to transition to full time crafter/blogger/Etsy seller and I am so glad there are blogs like yours to talk about this stuff :). Thanks so much for sharing these great tips!!! So happy you linked up at The DIY Dreamer! Thanks Marissa!! Great tips, and thanks for joining cowgirl up. Please come back next week. Thanks for the post! I live this scenario daily- and your article was spot on! Etsy and motherhood can co-exist. Glad you linked up to “Cowgirl Up!”. Thanks for sharing these great tips at the Kiss Me I’m Irish party over at I Gotta Create! So very helpful for so many. Awesome Post! If you don’t mind, I’ve gone ahead and bookmarked this post at Digg so my friends can see it too. I simply used Etsy Tips: Working At Home with Kids AKA Juggling Kids and Etsy – Rae Gun Ramblings as the entry title in my bookmark, as I figured if it is good enough for you to title your blog post that, then you probably would like to see it bookmarked the same way. Although from my singing experience, it’s important to not put too much tension on the abdominal muscles. That is why I found breath control exercises are important. I’ve tried inhaling for several seconds and then exhale softly as not to put pressure on your back muscles. There’s a good singing lesson video that I want to share, it’s called “Singing Voice Perfection”. I found it on Google and I’ve improved my singing ability after watching their 10 mini singing video lesson.